According to eggshell fragment studies, a significant dietary change occurred in the diet of Ad2lie penguins the early 1900s, when they went from eating fish to krill. Researchers Steven Emslie of the University of North Carolina in Wilmington, and William Patterson of the University of Saskatchewan in Saskatoon, studied over 200 fossil eggshell pieces ranging from 100 to 38 000 years old. By comparing the proportion of carbon and nitrogen in the shells with that found in fish and krill, it was possible to see how the birds' diet evolved over time. SciencePoles interviewed Dr. Steven Emslie, who has been studying the paleoecology of penguins in Antarctica for the past 15 years. According to your study on Adélie penguin eggshells, you noticed that a significant dietary shift had occurred within the past 200-300 years. How were you able to calibrate the shift to the early 1900s? Since the radiocarbon record is too imprecise to get an exact timing for this shift, we managed to calibrate when the shift had occurred by analyzing historic Adélie penguin eggshells that had been preserved in Scott's hut at Cape Evans, on Ross Island. Sometime between 1911-1917, members of either Scott's or Shackleton's parties, both of which used this hut as a base, collected penguin eggs for food, probably from the nearby Cape Royds colony. These eggs were never eaten and were still stored and intact in a wooden crate in the hut I saw in 2001. After we started obtaining results on the stable isotope analyses of the fossil eggshell, I requested permission to sample 20 of the historic eggs that were found in the hut for comparison. We took a small piece off of 20 broken eggs in the crate. 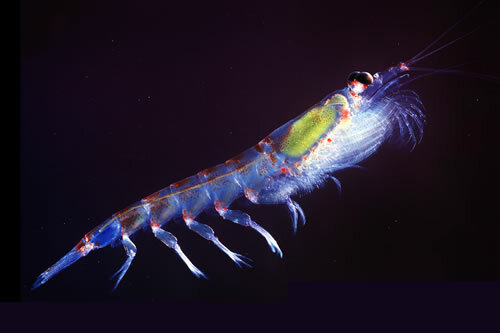 The analysis indicated that they had the same isotope ratio as the modern eggshell samples, which demonstrated that the shift to a krill diet had occurred by the early 20th century. You mention in your study the relevance of whaling and sealing in this sudden diet shift. How was this correlation established? We found no correlation between climatic events over the past 38,000 years with our stable isotopes and diet data collected from the eggshell. The sudden shift within the past 200 years was quite remarkable. It made sense then that the huge impacts of sealing and whaling on the southern oceans had had something to do with this shift. Furthermore, the 'krill surplus' hypothesis was already known to us since it had been proposed by other scientists in the 1980s. Some counter-arguments have been raised as to the validity of such a theory on Nature Newsblog. The argument brings to our attention the fact that whaling occurred at the beginning of the 20th century and that therefore "the major ecosystem changes as a result of harvesting would have occurred well after the apparent change in diet". Could you comment on this? I actually posted a response on this blog. Basically, the krill surplus was initiated first with the removal of millions of krill-eating fur seals. The sealing records are pretty good at establishing what the impacts were, beginning in the late 1700s. Sealing spread to the Antarctic Peninsula by 1819 and over 300,000 skins were removed before the industry collapsed due to seal depletion. Whaling began in the late 1800s, but lots of krill-eating fish were also being harvested in the 1800s and 1900s. The consequence of all these activities generated a krill surplus, which was then later maintained by whaling. How significant are your findings to the scientific community? I think the findings are quite significant to Antarctic marine science in validating the "krill surplus" hypothesis and in showing the large impact that humans have had early on in Antarctica. It is not the pristine environment that everyone imagines it to be. Yes, it is relatively pristine, but the marine environment is still recovering from the massive impacts that sealing and whaling have had there. This recovery may never occur, though, should current fishery trends and other impacts continue. This diet shift has been described as a form of "adaptation". How optimistic are you about the penguin's future adaptation capacities? Adélie penguins are real generalists when it comes to their diet. They eat a variety of fish, squid, and krill. I don't know, though, whether they would be able to sustain themselves with anything else should krill continue to decline. We have already seen a massive drop in Adélie population in the Antarctic Peninsula due to warming conditions, reduced sea ice, and less krill. In my opinion, this seems to indicate that they are out of options in the region and portends what may happen to them in the rest of Antarctica, as the impacts spread. Are there any questions that remain unanswered in this equation? Yes, many. The current trends in global warming will continue to impact all species in Antarctica. Right now, the impact is most severe in the Peninsula. The Ross Sea and East Antarctica being much colder regions, the warming trend is causing different effects in those regions. Will penguins adapt better over there? We cannot say. We are also studying the stable isotopes of active penguin colonies to better understand the diet variations in different colonies through time. Finally, we know very little about their winter diet. Stable isotopes can help, but more data are needed. What are the future prospects for the Adélie penguin? Can we expect the Ross Sea region to be protected as an ecological reserve? Is it realistic to see the penguins inscribed as protected species? One can only hope that regions like the Ross Sea can be protected. We have taken the first step in doing this, thanks to Dr. David Ainley. If support for this proposal builds, it may happen. Right now, Adélie penguins are not endangered. They still number in the millions in Antarctica. Although their populations are declining in some areas, they are stable in others. We have to keep a close watch on species like this as they are bioindicators of environmental change. However, other species of penguins outside of Antarctica are becoming more threatened and endangered right now, also needing more drastic actions to protect them. It's the same story everywhere and for all species: loss of habitat, pollution, environmental degradation, and mismanagement are taking their toll. Ecological reserves, education, and proper management can really help. Steven Emsilie is an expert in avian ecology and paleoecology. He has a particular interest in the fossil records of birds that lived during the Pleistocene Epoch (2.588 million years ago until the end of the last ice age 11,700 years ago), especially with regard to the evolution and extinction of birds in relation to climate change.